Siwertell, part of Cargotec, has signed a contract with the Spanish-Korean consortium,TR-Samsung, for a Siwertell ship unloader to support a new biomass-fuelled power plant under construction in Teesside, Middlesbrough, UK. The order was booked in Cargotec’s fourth quarter 2016 order intake and the delivery will take place in October 2018. 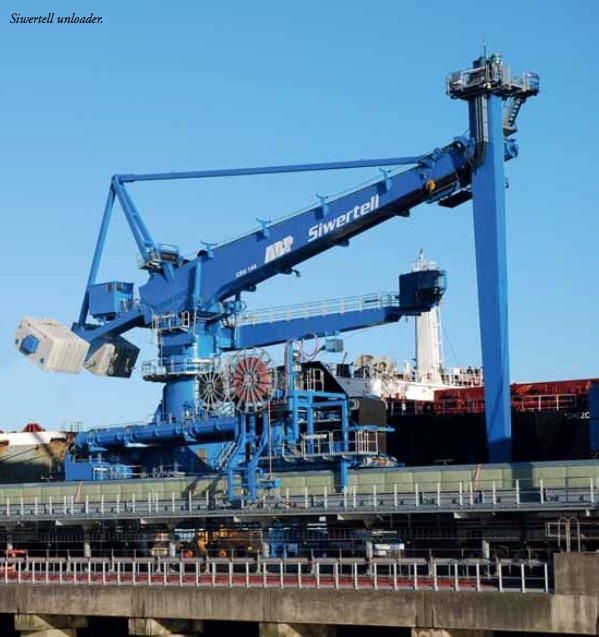 Siwertell will deliver a tailor- made, rail- mounted ST 790-type D Siwertell unloader, which will be located close to the 299MW plant in Teesport. It will discharge wood pellets and wood chips to a matched Siwertell jetty conveyor with a movable transfer trolley, supplied as part of the contract. Siwertell biomass unloaders are also equipped with a new-generation safety system to mitigate the risks of fire and dust explosion when handling biomass in an enclosed space. The unloader has a rated average capacity of 1,200tph (tonnes per hour) and a maximum rate of 1,320tph, designed to meet the plant’s requirements of 16,000 tonnes/day. It is equipped with a dual truck loading system for continuous direct truck loading at a rate of 300tph. This is a redundancy feature that allows operations to continue if the shore conveying system fails.